This year in the Gladstone School District, we will be serving a different local fruit or vegetable every month of the school year, using resources available from the Oregon Department of Education’s Oregon Harvest for Schools program. We know that the cafeteria can be an extension of the classroom, where students learn the healthy habits necessary for academic readiness and success. We also know that buying local foods is one way that our school can support local farms and our local economy. Plus, fresher food just tastes better! Did you know that tomatoes are actually a fruit? They are served and prepared as a vegetable, but because they have seeds in them, they are the fruit part of the plant. Oregon tomatoes are usually available between July and September, and they are quick and easy to include in meals. Some suggestions: toss chopped red and yellow tomatoes with your family’s favorite dressing for a quick and tasty salad, add tomato slices to sandwiches, or just eat cherry tomatoes as a tasty snack that kids will love. Check out the lunch menu to see when we’ll be serving local tomatoes! Apples are a perfect snack food; their natural sugars provide quick energy, and their fiber makes the eater feel full. Apples are best when eaten with the peel. When you eat an apple with the peel, you get the most fiber and nutrients. Oregon apples are harvested between July and November, and because apples are easy to store, they are available year-round. Ask for Oregon apples at your nearest market, and check out our lunch menu to see when we’ll be serving local apples here at school! Winter squash is a vitamin and mineral powerhouse. It provides vitamin A and C, potassium, magnesium, and lots of other essential vitamins and minerals. Vitamin A keeps your eyes and skin healthy, and helps your body fight infections. Pumpkins are perhaps the most well-know winter squash, but there are a wide range of varieties that come in all sorts of colors: pale green, while, yellow, tan, dark green, and even blue. Check out our lunch menu to see when we’ll be serving local winter squash here at school! Strawberries grow in Oregon from May through August, but can be frozen and eaten year-round. Oregon’s long mild spring, warm summer days, cool summer nights, and fertile soils help Oregon farmers grow some of the sweetest strawberries around. Did you know that strawberries are the only fruit with seeds on the outside? The average strawberry has more than 150 seeds on its surface. Check out our lunch menu to see when we’ll be serving local strawberries here at school! Did you know that potato skin is rich in fiber and nutrients? Potatoes are a good source of carbohydrates, and also contain fiber, iron, vitamin C, and potassium, which is important for muscle and nerve functioning. Potatoes can be very colorful: varieties include white, tan, brown, red, gold, blue and purple. And, potatoes are simple to cook. They can be baked, micro-waved, boiled, roasted, fried, sautéed, or grilled. Check out our lunch menu to see when we’ll be serving local potatoes here at school! Did you know that pears are Oregon’s State Fruit? There are over ten varieties of pears grown in Oregon, each with its own color, flavor and texture. Fresh Oregon pears are at the peak of their season from September through March, and some varieties, like the Anjou pear, are available nearly year-round. Pears make for a quick and easy snack that kids love: eat one plain, or cut one in half and top it with peanut butter or yogurt and a sprinkle of cinnamon. Yum! Check out our lunch menu to see when we’ll be serving local pears here at school. There are many different kinds of lettuce greens that can be served in salads; darker leaves have more nutrients than lighter-colored leaves, so try and choose salad leaves that are darker in color. These leaves are an excellent source of vitamin K, which helps stop cuts and scrapes from bleeding too much. Salads are a great meal to prepare with kids, since leaves can easily be torn into bite-sized pieces. Add fun toppings such as raisins, cherry tomatoes, strawberries, or apple chunks to make a delicious salad at home, and check out our lunch menu to see when we’ll be serving local salad greens here at school! Washington, California, and Oregon grow the majority of sweet cherries in the United States. The Oregon sweet cherry season starts the first week in June and can run through mid-August, although cherries from different regions and of different varieties ripen at different times. You can freeze cherries so that they last year round, by rinsing them thoroughly, spreading out a single layer on a cookie sheet, and placing them in the freezer overnight. Once the cherries are frozen, transfer them to a heavy plastic freezer bag. Cherries make a great snack at home (just wash and eat, but don’t forget that they have a hard pit in the middle!). Check out our lunch menu to see when we’ll be serving local cherries here at school. When we eat asparagus, we are eating the stem of the plant. Did you know that asparagus can grow as much as one inch per hour, up to 12 inches in one day?! Green asparagus is most common in the United States, but asparagus can be green or white. The harvest season for Oregon asparagus is typically mid-April through June, though it can be frozen and enjoyed year-round. Asparagus is full of important vitamins and nutrients, including vitamins A, C (helps the body heal cuts and wounds and helps lower the risks of infection), E (helps protect your body’s cells, and helps keep your immune system, skin, and hair healthy), and vitamin K. Check out our lunch menu to see when we’ll be serving local asparagus here at school. Kids love to eat green peas, and peas are good for eyesight and for fighting infection. Did you know that Thomas Jefferson grew over 30 varieties of peas in his garden? Peas are not only good for our bodies, but they are good for the soil as well. Peas are “nitrogen fixers” which means that their roots put nitrogen, an important nutrient, back into the soil for other plants to enjoy. Snap and snow peas are edible pod peas, and can be eaten whole with their pod. Another variety, green peas, are removed from their pod before eating. Both types of peas can be eaten raw or cooked. Check out our lunch menu to see when we’ll be serving local peas here at school! There are several types of summer squash, but zucchini is the most popular. Did you know that the word zucchini means little squash in Italian? Other types of summer squash include Patty Pan, Tromboncino (which looks like a musical instrument), Eight Ball, Yellow Crookneck, and Gold Rush. 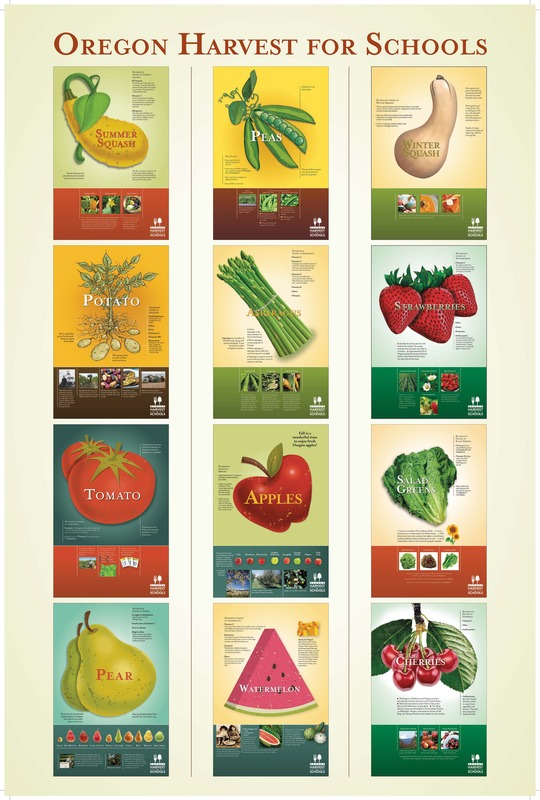 Look for these varieties and more at your local farmer’s market or grocery store, or grow them at home. And, don’t forget to check out our lunch menu to see when we’ll be serving local summer squash here at school! Watermelon is the perfect summer food; it is more than 90 percent water, so it is great at helping you stay hydrated on hot days. Watermelon is also high in lycopene, which is an antioxidant that helps reduce the risks of cancer and other diseases. The city of Hermiston, Oregon is famous for its large, juicy watermelons. Oregon watermelons are available in grocery stores and at farmers markets and farm stands in late summer and early fall. Check out our lunch menu to see when we’ll be serving local watermelon here at school!